Here is my summer mantel decor for this year. It probably isn’t a big surprise that I went for a beach theme once more. Summer just conjures up images of the blue sea, the sand, the sun and I always feel that summer decor can’t go without some beach inspired little accessories. You might recognize the basic set-up, since it is my layered photo frame mantel that I did at the beginning of the year. I still love it so very much and wasn’t ready to part with it. However I was ready for a little summer update. I switched out some of the images in the frames for beach pictures, which brought in some cheerful color and the combination of blue and white just screams summer to me. I have to thank Sarah from A Beach Cottage for all the beach images. She lives and blogs in Australia and is single-handedly responsible for my cravings to emigrate to the lucky country. On her morning walks Sarah just ‘snaps’ the most amazing images of the beach and blue sea. I looked through my own summer vacation photographs first, but none of my images had that radiant blue I was looking for. I hope Sarah feels honored that her photo’s now take up prime residence in my living room. If you haven’t visited A Beach Cottage yet, you sure should. I just love everything Sarah does in her sweet home, I’d steal and transplant the whole house over here, if I could. So with thanks to Sarah, here is my summer mantel decor with a beachy vibe. As you can see I added some shells and sea stars. The blue ones have been died with fabric dye, so easy and simple to do, just dip and drip. Grin, that sweet chair in the surf was actually Sara’s Christmas picture. But he, down-under summer and Christmas come around at the same time, so I thought it was fitting. My real coral (found at a flea market, so not harvested recently), and my shell balls just had to make an appearance in my summer mantel. It just isn’t summer without them. Some flowers from my garden in ‘blue’ and white just finish it off. The container is from Ikea, I put a glass in there so I could use it as a vase. I wonder if I’ll be ready to part with this layered photo frame mantel when Fall comes around? Probably, we’ll see. But for now I don’t want to think about Fall yet, summer has yet to begin. And with each step in my project summerification I am more ready for it. My summer mantel decor is ready! Let’s go enjoy the sunshine, sand and sea!!! Your beach mantel is very lovely. I was wondering what your frames are attached to. If you look closely you can see that the frames are all dangling from twine, that is why some of them are a bit crooked. 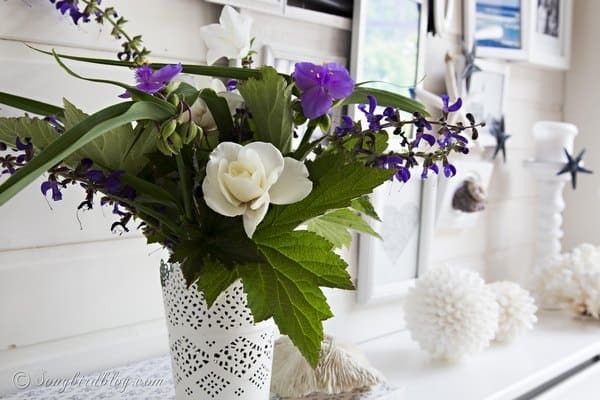 Hi Marianne..your Beach decoration looks so lovely..I styled my terrace this Year like a Beach Cottage. Have a nice sunny Weekend..
Just love it. You’ve been creative with the basic concept. It looks all new!! Doesn’t that sparkle of blue just change it all?? I love your flowers. I have good intentions…since your Valentine post of this layout but I used all my frames as gifts!!! I will someday get to my hallway wall!! But I did a simple summer mantle ( mine is an inch and a half maybe) and finally switched my china cabinet display shelves and my pillows and duvet cover to summer!!! I pick a few flowers and enjoy the look. Yours looks so awesome though!!! Oh and I enjoyed NYC artistic b/w photos. Very well written article and visually well done!! I’ve never been!!! Blue, white and starfish always say summer to me. Starfish remind me of when I was a little girl, along with sand dollars, and nothing says coast like blue and white. So pretty Marianne. So pretty and fresh for summer! Love the colors! Thank you! I am loving it everyday too. 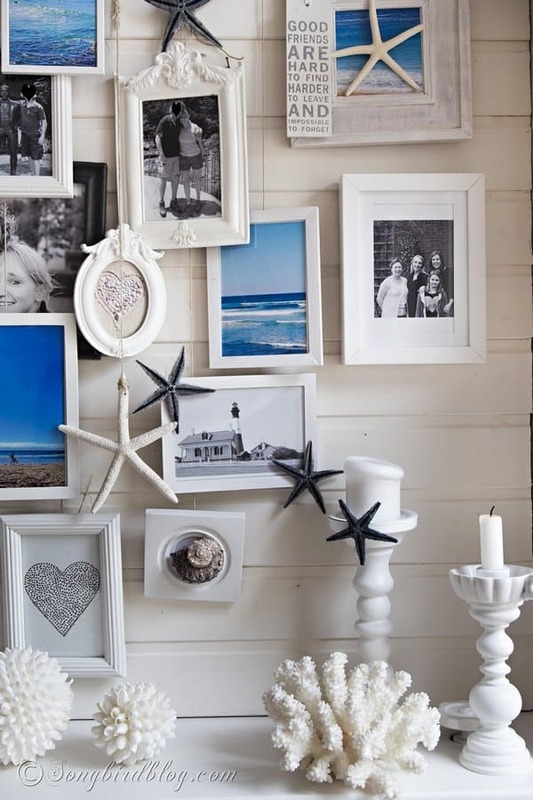 just love everything about this summer mantel. probably more then anything are your use of pictures…memories. lovely.